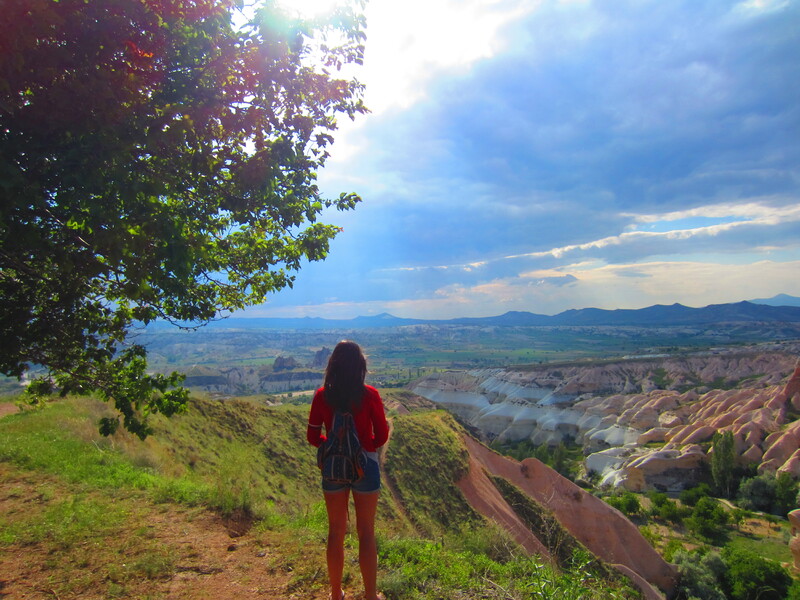 An accidental guided hike through Capadoccia’s Rose Valley | more mojitos please! 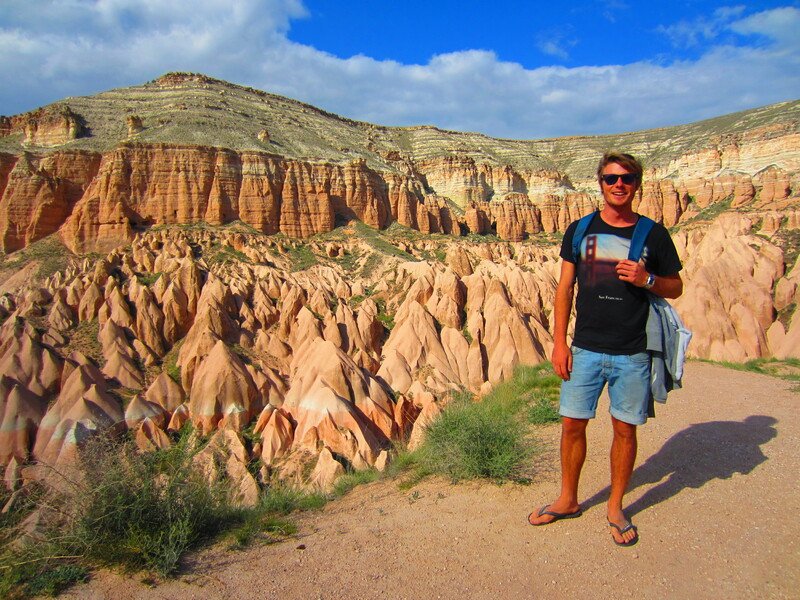 Some of our fellow travelers had given us the hot tip that the self-guided hike through the nearby Rose Valley was incredible, so Will and I quickly decided that would be our course of action for our second day in Goreme. We’d been told that the signs were quite obvious, so surely we’d be able to figure it all out ourselves, right? In hindsight, I probably should have felt a little more dubious about this! 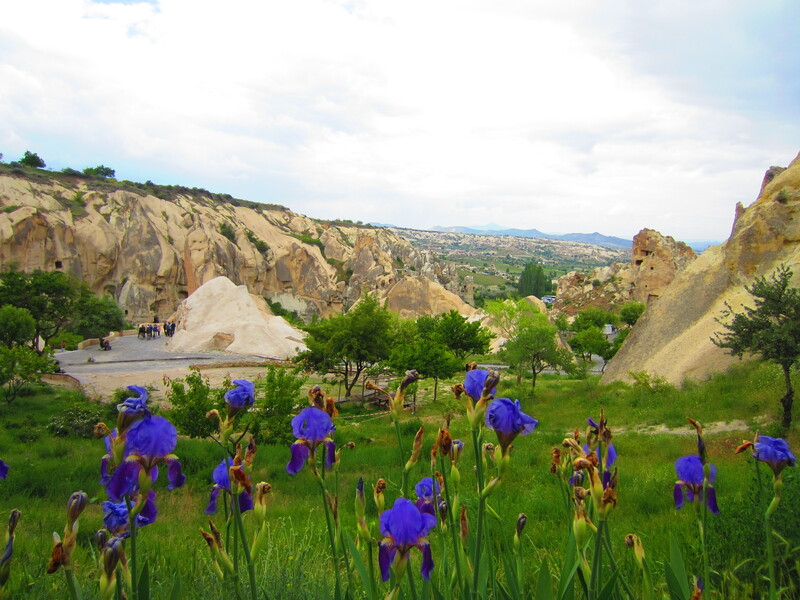 We began our day with a visit to the Goreme Open-Air museum, located a short 15 minute walk along one of the main roads leading out of town. As we were there on a Saturday the foreign tourists were few and far between and the place was completely inundated with Turkish school children. We were resting for a few moments on some stairs near the entrance when one of the most bizarre experiences of the trip thus far occurred. A group of around forty Turkish teenagers spotted Will and all of the sudden came running over, screaming and holding their camera phones out whilst yelling at their friends to come and join. ‘You’re handsome, so handsome!’ they shrieked at Will as they all bustled to sit beside him and have their photos taken. The waves of teenagers just kept on coming and we could do nothing more than hysterically laugh at it all as we posed for photos continually for the next little while. A few token boys squeezed into have their photos taken with me but it was clear that Will was the star attraction! I think I may have heard them yell out ‘Zac Efron!’ a few different times, so it may have been a bit of a case of a mistaken identity? Who knows what they thought? Either way, Will’s sandy locks were a big hit and we got a sneaky little taste of how weird it must feel to be an (incredibly minor) celebrity! After escaping the screaming mob of teenagers we made our way further uphill, roughly following the instructions we’d been given for joining the Rose Valley trail. My terrible ear for directions failed me once again and we managed to walk straight past what we later learnt was the entrance to the track. Unaware of the entrance, we continued uphill along a dusty road that genuinely seemed to be taking us into the middle of nowhere. 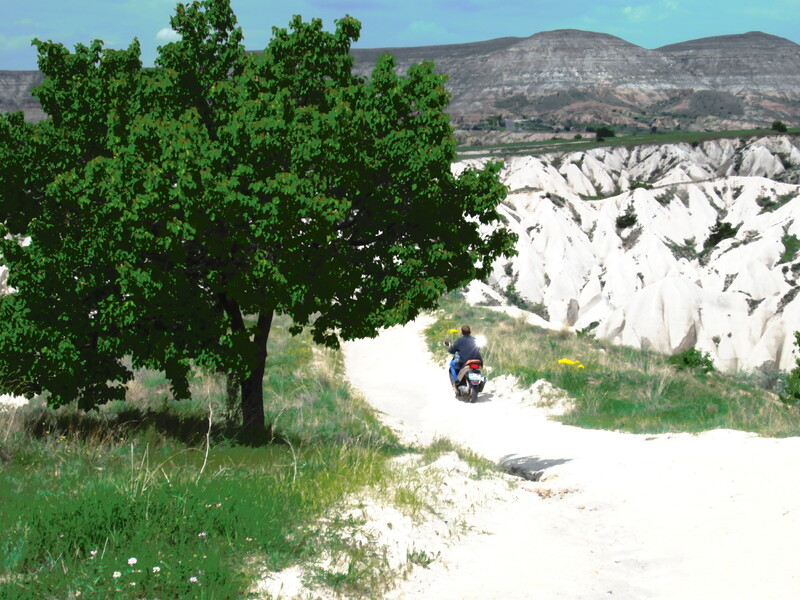 Our saviour arrived in the form of a local Turkish farmer who wobbled past us on an ancient looking motorbike. We had wandered off the road onto a dusty little goat track when he appeared, pointing to our left and nodding whilst yelling out a muffled ‘rose, rose!’ as he continued on in that direction. Thankful to finally have an idea of which route to take we began scrambling along the path, our steps a little more certain now that we knew we were on the right track! As we reached the end of the ridge and saw a steep and rocky trail leading down to the valley below we were surprised to find the farmer waiting by his motorbike for us. Upon a closer look we realised that the farmer had a hearing aid behind each ear and as he began signalling to us with his hands it became clear that he was quite severely hearing impaired. His day to day practise in making his point known without speech seemed to definitely work to his benefit in this case. Eventually through a combination of some clear gesturing, some pointing at his parked bike and some cheery facial expressions he made it known that he wanted to lead us down to the path. Note the hand holding – barely got my hand to myself for the rest of the day! Grasping my hand to ensure I didn’t slip (who said chivalry was dead?) he led us down the winding track into the valley below. As we reached the bottom I was completely taken aback by how lush and green everything was. 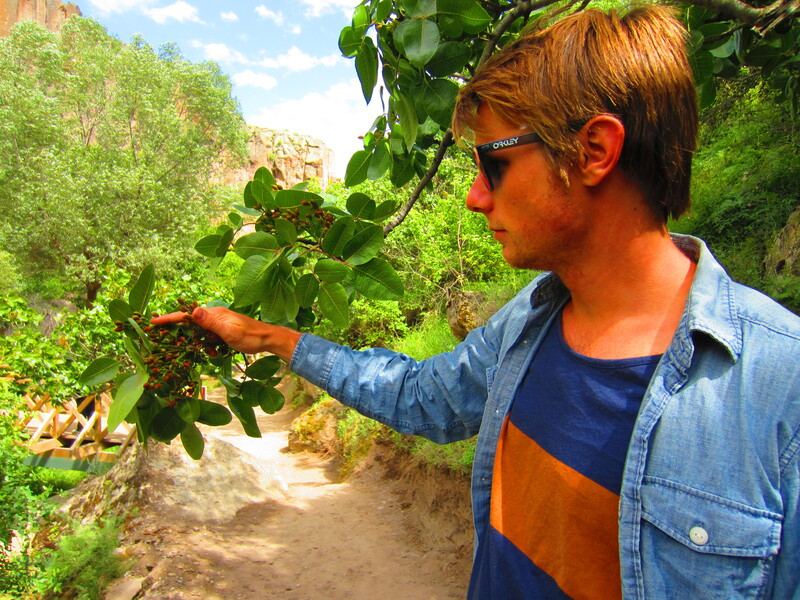 The farmer led us along a track adjacent to a small creek that wound its way through the valley. 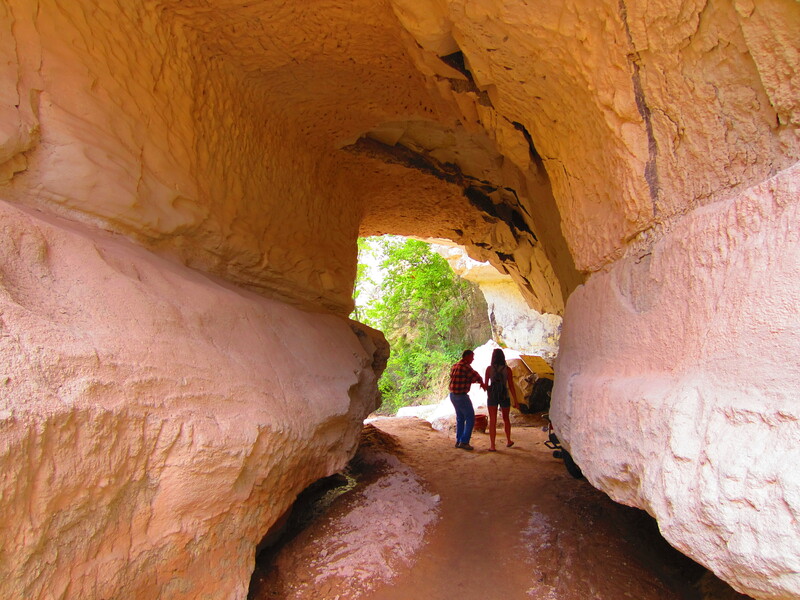 We clambered through a number of high roofed caves, past by fruit trees drooping heavily with stone fruits and slid down some more steep trails – more chivalrous hand holding for me of course! For someone who wasn’t really able to talk in Turkish or in English our farmer really loved a chat! As we walked along, we discovered through the hand gestures that he was married, had a little son, lived 5 minutes from where we met him and had decided it was too hot to work on the farm for the rest of the day. In turn, he discovered that no, Will and I weren’t brother and sister, we were together – but not married, and had no children thank you very much! 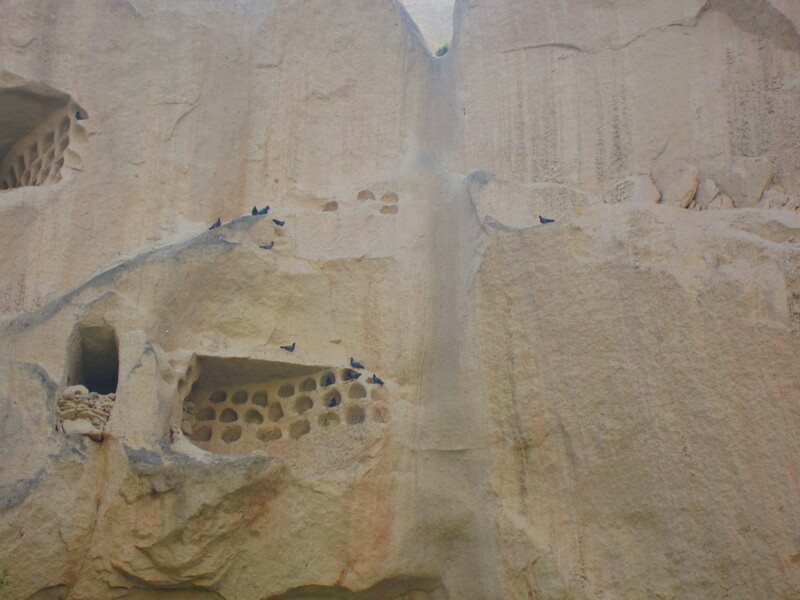 Some pigeons hard at work in their houses, providing the poop that makes Capadoccia’s fruit so delicious! Through some pointing and flapping motions he indicated the locations of scores of the ‘pigeon houses’ located along the cliff faces encasing the valley. 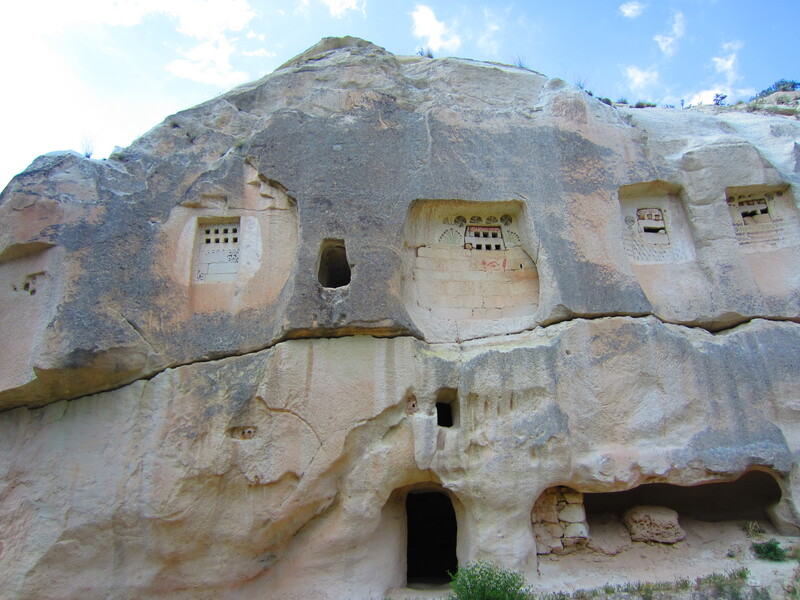 Capadoccian farmers have been using pigeon droppings as fertiliser for hundreds of years, so these houses were carved into the rock close to abandoned caves and shelters. 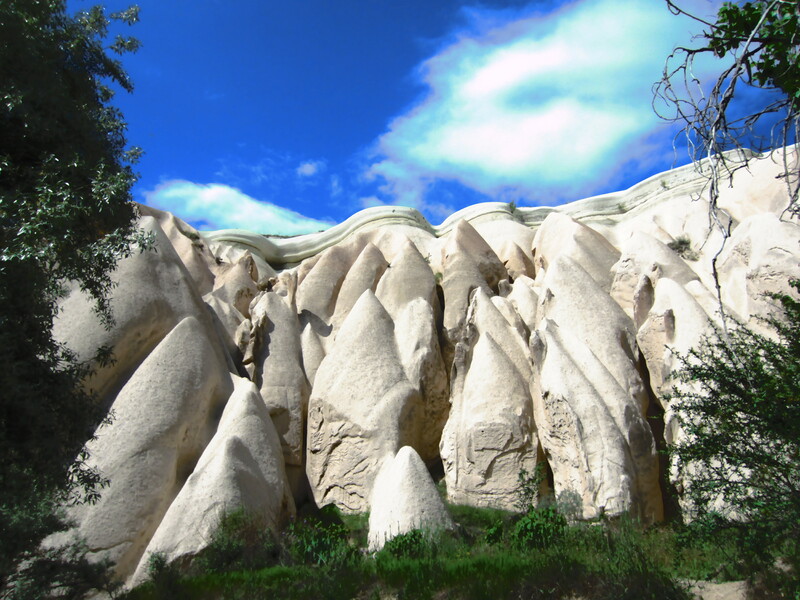 Many farmers claim that the fruit of Capadoccia is especially sweet and delicious due the nutrients in the pigeon droppings! The valley was also lined with scores of very phallic looking ‘fairy chimneys’. 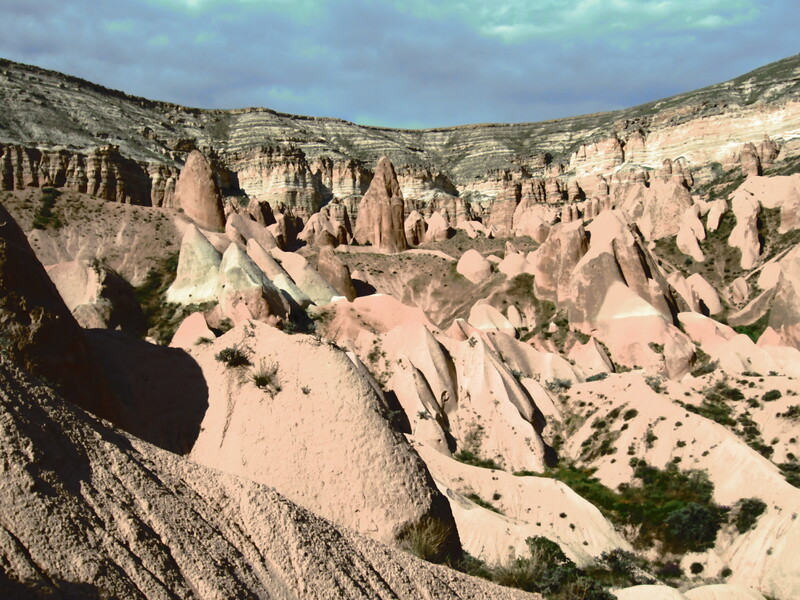 Fairy chimneys are extremely common in the Capadoccia region and look almost like natural turrets from a castle. The name ‘fairy chimneys’ is a result of visitors to the region believing that the strange rock formations were haunted in ancient times. Many pigeons would nest within the chimneys and the echoing of their calls in the nighttime apparently used to terrify those who weren’t familiar to the region! The afternoon grew later and the scenery even more spectacular – the valley opened up to reveal a vast canyon, the sheer rock faces highlighted with thick streaks of red, yellow and orange. At one stage, the farmer (whose name we sadly never learnt as he wasn’t really able to annunciate it) showed us the above the peep holes in the side of the cliff. From the exterior it just looked like all of the other small cave shelters we had been passing by throughout the afternoon. 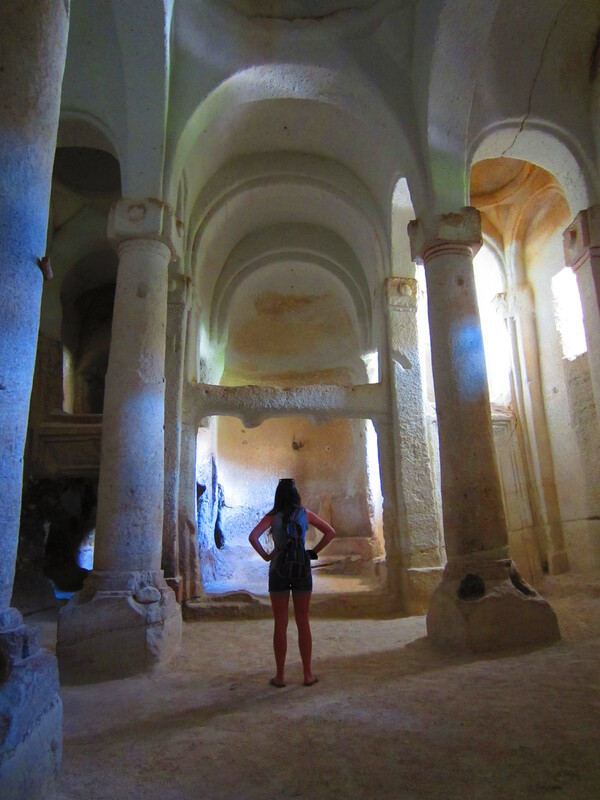 A quick dash down and over a deep ditch lead us inside the structure – and into a huge, high-roofed chapel that had been intricately carved directly into the rock! We were both completely blown away by the size and beauty of the place and it was definitely a highlight of the day for me. By this stage of the day old mate’s former chivalry had managed to progress to him hugging me at any possible moment whilst gesturing to Will that he should return to Australia and leave me to stay with him. His cheeky smiles and love heart gestures were quite adorable but also simultaneously a little creepy, so Will made sure that he was always just a step or two behind us to keep him in line! The bar we stumbled upon for a well deserved afternoon vino! 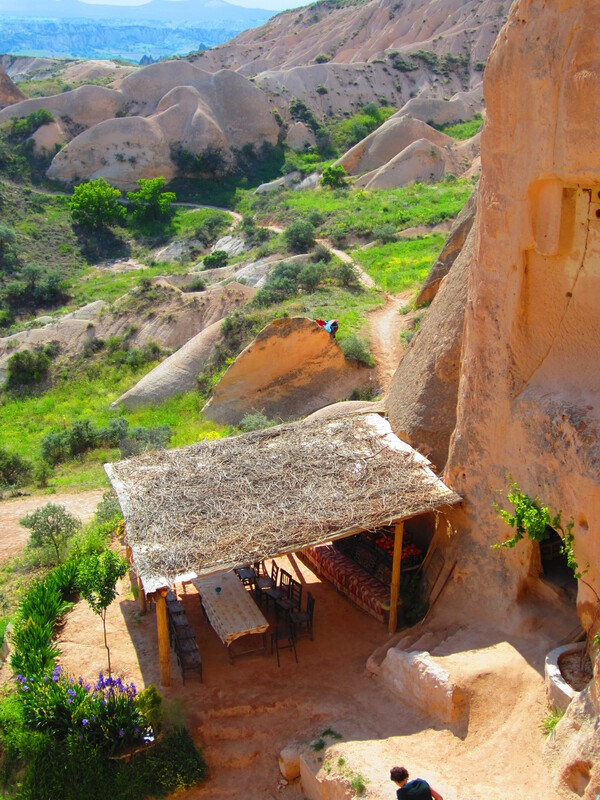 After reaching the top of one ridge we spotted a small shaded bar café nestled into the side of the one of the larger fairy chimneys. Feeling our rather active day thus far deserved a little reward we stopped for an afternoon beverage and chatted with an Australian couple who had also unintentionally stumbled upon the place as we looked out over the valley. Refreshed after our rest we continued on with the farmer along a narrow but high ridge that allowed us incredible views of the canyon to our right and Rose Valley to our left. 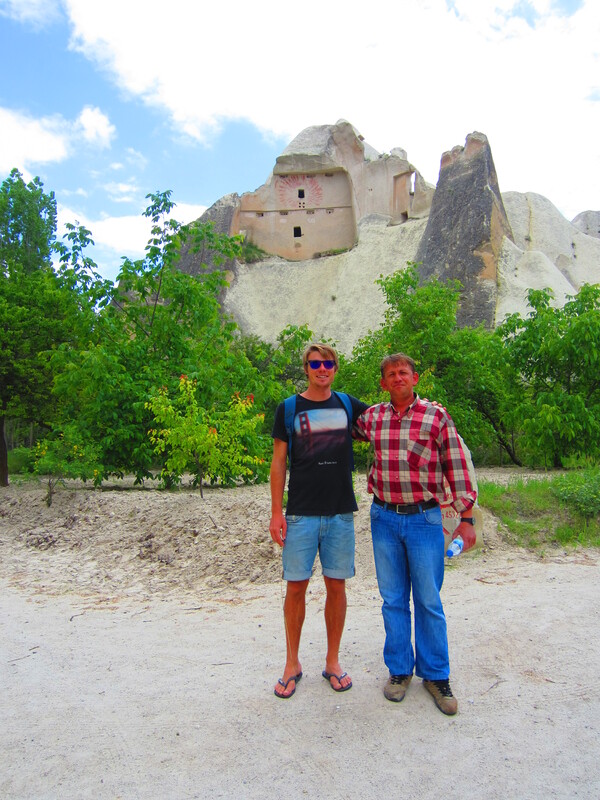 Almost 4 hours after we first meet our unintentional guide we reached the town of Çavuşin. 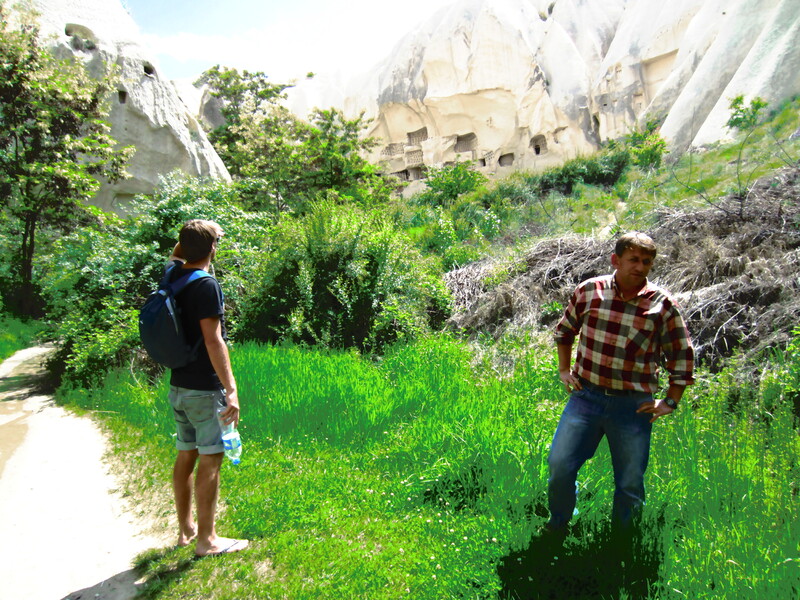 By making a loud ‘zooming’ noise and sticking his thumb out he indicated that we would be hitchhiking back to Goreme. I started to reach for my wallet out to give him a tip for all of his troubles, I mean surely – a 4 hour guide does’t come completely for free does it? The bold farmer beat us to it though, drawing the number 60 in the ground with a stick to indicate that his fee was 60 Turkish Lira (about $36). We were a little taken aback that he just requested an amount – of course we had intended to tip – but this was about the amount you could expect to pay for private organised tour with a guide who spoke fluent English! In the end we decided that despite his slight cheekiness we had enjoyed the day so much it really was very much at all. With a token bargain down to 50 we paid the amount before all jumping into the first car that pulled up beside us once we reached the nearby main road. After a short 5 minute zoom along the road we arrived in Goreme where the driver let us out with a refusal to accept the few Lira I tried to pay him for the ride. The farmer gave us both a big bear hug (perhaps holding me a little longer and tighter then was entirely necessary!) before indicating to Will again that he really felt I should stay behind with him in Turkey. He wandered off back in the direction of his parked motorbike, no doubt happy with his earnings for the day. We trudged back towards our pension, blown away by the magnificence of the valley – but also chuckling at the fact only we could have managed to have accidentally hired a Turkish deaf farmer who spoke not a word of English as a guide! Awesome rock formations! I love this stuff! Thanks for sharing!